As a home-educating mom I am always excited when a kids educational game arrives for us to test out and review. I love educational games that encourage the kids to learn in a relaxed manner while having a bit of fun. We were recently sent the Timeline British History game (part of being a Rainbow Toy tester) and I have to admit for me this game is a great History resource. Firstly the game is packed in a lovely tin, perfect for storing the cards in when they are not been used (I don’t like games or toys which arrive in boxes that are not suitable for them to be stored in afterwards). The cards in the box are double-sided. One side is a picture of a historical British event with a few key words and on the reverse side is the same picture and key words but with the date on. And there are lots of cards which means it covers lots of British events, including the major events you would expect to find as well as some lesser known events all the way to 2016 (voting to leave the EU). The aim of the game is to be the first player to place all of your cards into the ‘timeline’. Each player receives four cards. The players must lie these cards out in front of them, with the date side down (so no-one sees the date). One card is placed in the center with its date facing up. Now each player takes it in turns to guess where their event (of the 4 cards they have in front of them) goes in the timeline. They do this by placing their card on the timeline in the position which they think is correct and then they turn the card over to reveal its date. If they get it correct the card becomes part of the timeline, however, if it is incorrect that card is placed in a discard pile and the player must take a new card from the pile. The first person who has no cards left is the winner. The concept of the game is straightforward but as it relates to Historical events the age recommendation is for 8 and upwards. 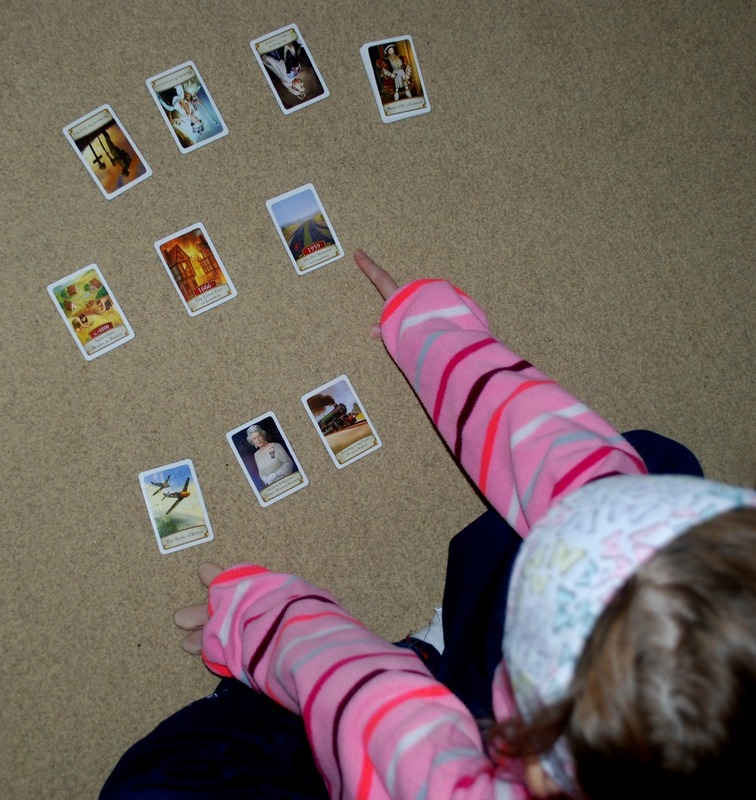 When my daughter and I first tried the game I reduced the pack of cards – I purposely chose a selection of cards of the more famous events and we focused on those. This worked really well as we got into the game. However as often happens when you have a younger sibling her brother soon wanted to join in (he is almost 6). The two of them enjoyed trying to decide where the cards should be placed on the timeline and our game became more of a family “lets build a timeline activity”. The kids loved this and we have subsequently done this a few times. In fact they asked for the box to get placed on their bookshelf so that they could use the cards to build their own timelines. I personally think this is a great educational game. And although playing the game “correctly” according to the instructions does require some historical knowledge if you are flexible and allow your kids to build their own timelines and chat about the events the need for prior historical knowledge becomes less important. 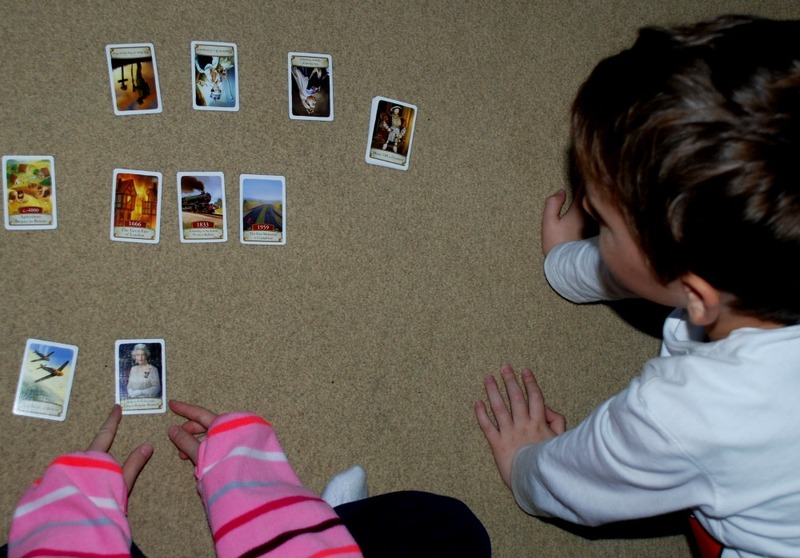 For me this game is a great way to help the kids learn about the order of events and it gets both kids talking and asking questions which normally leads to more reading. Would I go out and buy this game for my kids ? YES. In fact after watching my kids “play with the cards” I have actually gone online and searched for other Timeline games as possible Christmas pressies. Disclaimer – We were sent Timeline British History to review for the Rainbow Toy Awards – all words and opinions are our own. This entry was posted in reviews and tagged British History, educational games, home education, homeschooling, reviews, timelime british history. Bookmark the permalink. I love the Timeline games, they’re so simple but clever and easy. The adults of the family have played the Inventions pack, I’m waiting for my little ones to be older to be able to join in.